Release agents, SPC semi-permanent film, KantStik Curefast, fiberglass mold release, mold releases, and external mold release. High performance semi-permanent products widely used in general thermoset and thermoplastic applications in these industries: cultured marble and solid surface, filament winding, marine, tub and shower, automotive, and aerospace. Semi-permanents on this page are solvent-based. Please call us if you prefer information on water-based semi-permanents. Additional release agents are available on the Misc. release agents and Paste wax pages. A unique external mold release agent that is used for fabricating thermosets and thermoplastics composite resin systems. Can be used when fabricating both gel coated and non gel coated composite parts. Particularly useful when using thermoset resins such as polyester, epoxy, and phenolic resin composite materials. Also suited for molding thermoplastic resins. Positive release with accurate surface reproduction. It is semi-permanent and non-transferable so the post-processing operations are unaffected by its use. The film produced is made of a non-silicone organic polymer capable of withstanding high molding temperatures in excess of 700°F without deterioration. High temperature capabilities yielding high gloss parts. Not as many pulls as KantStick SPC 1.0, but it's a semi-permanent sealer/release agent in one. Sealer and release agents are incorporated into one product for one-step application. Semi-permanent release system that effectively seals pores on both new and reconditioned tooling used in the fabrication of polyester and epoxy base surfaced composite parts. Will provide a positive release with accurate surface reproduction. Curefast uses the latest dry film lubrication technology. 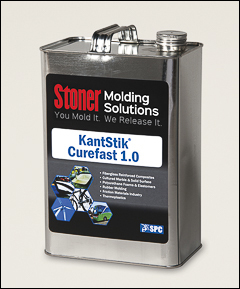 No cure time between coats and gives you multiple molding cycles between applications. Will withstand high molding temperature conditions in excess of 700° without deterioration. It is non-transferable, so it will not affect post-processing operations. Particularly useful with thermosets such as polyester, epoxy, melamine, phenolic resins such as PVC, ABS, nylon, PP, PE, & acrylics. For both gel coated and non gel coated composite parts. Superior in most molding processes. Use with KantStik mold cleaner.